In its mission to preserve the integrity of competition, inspire true sport, and protect the rights of athletes, USADA is unwavering in its belief that every athlete has the right to compete on a clean and level playing field, free from the pressures and influences of performance-enhancing drugs. For this reason, USADA makes available a number of ways to report the abuse of performance-enhancing drugs in sport in an effort to protect clean athletes and promote clean competition. You may report a tip using one of the methods below. If you would like to remain anonymous to USADA, do not provide any contact information. However, if you are willing to communicate directly with USADA’s Investigation Team regarding your tip, please provide contact information and someone will respond to you. 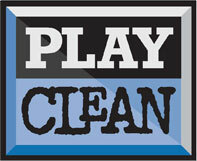 Please be advised that all Play Clean Tips are considered confidential information and that speaking to or otherwise communicating with USADA does not change the confidential status of the information provided or waive your right to remain anonymous throughout USADA’s investigation of another person and any resulting disciplinary proceedings. Thank you for your willingness to protect the rights of clean athletes and clean competition. Please fill out the form below to send a confidential tip to USADA. Please provide as much information as you can concerning the potential doping offense you are reporting so USADA can best investigate your tip. Information or evidence can be sent by mail to USADA.